Includes hand pump - Actual color of hand pump will vary. Directions for hand pump: 1. Screw plastic tip onto the end of hand pump. 2. Very tighly hold the mouth of the balloon over the tip of the pump. Be sure to have no air getting out. 3. 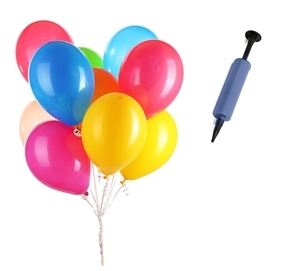 Pump hand pump briskly until desired air is in balloon.